Our models can all be downloaded and viewed on a Windows PC (XP SP3 or later) using our free Vectric 3D Viewer (*.v3v) files. Design & Make Machinist can be used to preview Vectric 3D Viewer files in a fully interactive virtual 3D environment on your own PC. This allows you to see the quality and variety of the individual models in our store before you make your purchase. You can also find the associated Vectric 3D Model in our store for any preview you have previously downloaded using Machinist - simply open the saved preview file, click Next and follow the instructions. 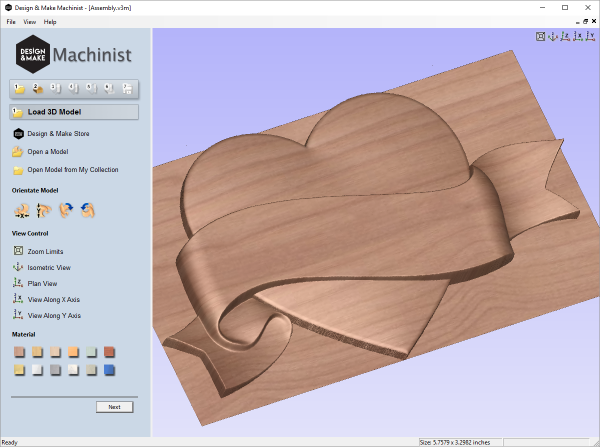 If you do not yet own any Vectric Machining software, Design & Make Machinist will allow you to create 3D toolpaths for any of the models you have purchased from our store. There is no charge for downloading Machinist or any of the Vectric 3D Viewer files. You are welcome to use these files as a sales tool to sell 3D design ideas to your customers. In order to produce toolpaths from our models you will need to purchase the full Vectric 3D Model (*.v3m) file associated with preview you have downloaded. Vectric 3D Model files contain the highest detail data and additional information that is essential for machining. Preview files cannot be machined. If you have not previously installed Design & Make Machinist then do this first. Typically, the files downloaded using the links on this page will be saved in your PC's Downloads folder by your web browser. From most browsers you can open the Downloads folder on your PC by pressing Ctrl+J once the download has completed. Once Design & Make Machinist has been downloaded and installed, you can double-click on any Vectric 3D Viewer (*.v3v) or Model (*.v3m) files on your PC to open them directly. Alternatively, use the Open Model options within Machinist. Rotate View – Click left mouse button and move mouse (left drag). Zoom View – Click right mouse button and move mouse up to zoom in and down to zoom out (right drag). Pan View – Hold the Ctrl key and the Left mouse button or hold both left and right mouse buttons then move the mouse to pan the View (both drag). Materials – The material of the model can be selected from the colored squares, you can see the name of the material if you hover the cursor over them.